Originally published under the title "Russia's Trap: Luring Sunnis into War." After Russia's increasingly bold military engagement in war-torn Syria in favor of President Bashar al-Assad and the Shiite bloc, the regional Sunni powers – Turkey and its ally, Saudi Arabia – have felt nervous and incapable of influencing the civil war in favor of the many Islamist groups fighting Assad's forces. Most recently, the Turks and Saudis, after weeks of negotiations, decided to flex their muscles and join forces to engage a higher-intensity war in the Syrian theater. This is dangerous for the West. It risks provoking further Russian and Iranian involvement in Syria, and sparking a NATO-Russia confrontation. After Turkey, citing violation of its airspace, shot down a Russian Su-24 military jet on Nov. 24, Russia has used the incident as a pretext to reinforce its military deployments in Syria and bomb the "moderate Islamists." Those are the Islamists who fight Assad's forces and are supported by Turkey, Saudi Arabia and Qatar. The Russian move included installing the advanced S-400 long-range air and anti-missile defense systems. Turkey and Saudi Arabia say they are ready to directly challenge Russian-backed pro-regime forces in Syria. Fearing that the new player in the game could vitally damage their plans to install a Sunni regime in Damascus, Turkey and Saudi Arabia now say they are ready to challenge the bloc consisting of Assad's forces, Russia, and Shiite militants from Iran and Lebanon. As always, Turkish Prime Minister Ahmet Davutoglu spoke in a way that forcefully reminded Turkey-watchers of the well-known phrase: Turkey's bark is worse than its bite. "No one," he said on Feb. 9, "should forget how the Soviet forces, which were a mighty, super force during the Cold War and entered Afghanistan, then left Afghanistan in a servile situation. 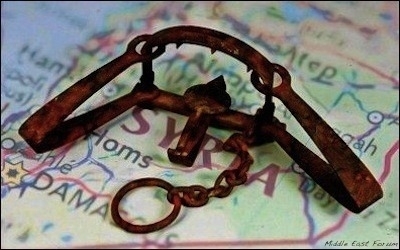 Those who entered Syria today will also leave Syria in a servile way." In other words, Davutoglu was telling the Russians: Get out of Syria; we are coming in. The Russians did not even reply. They just kept on bombing. Turkey keeps threatening to increase its military role in Syria. Deputy Prime Minister Yalcin Akdogan pledged that Turkey will no longer be in a "defensive position" over maintaining its national security interests amid developments in Syria. "Can any team," he said, "play defensively at all times but still win a match? ... You can win nothing by playing defensively and you can lose whatever you have. There is a very dynamic situation in the region and one has to read this situation properly. One should end up withdrawn because of concerns and fears." Is NATO member Turkey going to war in order to fulfill its Sunni sectarian objectives? And are its Saudi allies joining in? If the Sunni allies are not bluffing, they are already giving signals of what may eventually turn into a new bloody chapter in the sectarian proxy war in Syria. First, Saudi Arabia announced that it was sending fighter jets to the Incirlik air base in southern Turkey, where U.S. and other allied aircraft have been hitting Islamic State strongholds inside Syria. Saudi military officials said that their warplanes would intensify aerial operations in Syria. "[A] ground operation is necessary ... 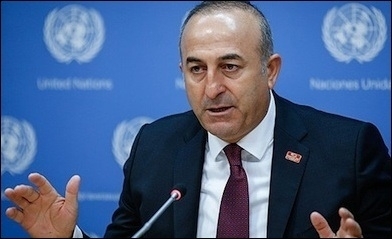 But to expect this only from Saudi Arabia, Turkey and Qatar is neither right nor realistic," Turkish Foreign Minister Mevlut Cavusoglu said on February 16. Second, and more worryingly, Turkish Foreign Minister Mevlut Cavusoglu said that Turkey and Saudi Arabia could engage in ground operations inside Syria. He also said that the two countries had long been weighing a cross-border operation into Syria – with the pretext of fighting Islamic State, but in fact hoping to bolster the Sunni groups fighting against the Shiite bloc – but they have not yet made a decision. In contrast, Saudi officials look more certain about a military intervention. A Saudi brigadier-general said that a joint Turkish-Saudi ground operation in Syria was being planned. He even said that Turkish and Saudi military experts would meet in the coming days to finalize "the details, the task force and the role to be played by each country." In Damascus, the Syrian regime said that any ground operation inside Syria's sovereign borders would "amount to aggression that must be resisted." It should be alarming for the West if Turkey and Saudi Arabia, two important U.S. allies, have decided to fight a strange cocktail of enemies on Syrian territory, including Syrian forces, radical jihadists, various Shiite forces and, most critically, Russia – all in order to support "moderate" Islamists. That may be the opening of a worse disaster in Syria, possibly spanning over the next 10 to 15 years. Allowing Sunni supremacists into a sectarian war is not a rational way to block Russian expansion. The new Sunni adventurism will likely force Iran to augment its military engagement in Syria. It will create new tensions between Turkey-Saudi Arabia and Iraq's Shiite-dominated government. It may also spread and destabilize other Middle Eastern theaters, where the Sunni bloc, consisting of Turkey, Saudi Arabia and Qatar, may have to engage in new proxy wars with the Shiite bloc plus Russia. Washington should think more than twice about allowing its Sunni allies militarily to engage their Shiite enemies. This may be a war with no winners but plenty of casualties and collateral damage. Allowing Sunni supremacists into a deeper sectarian war is not a rational way to block Russian expansion in the eastern Mediterranean. And it certainly will not serve America's interests. Turkey and Saudi Arabia are too weak militarily to damage Russia's interests. It is a Russian trap – and precisely what the Russians are hoping their enemies will fall into.